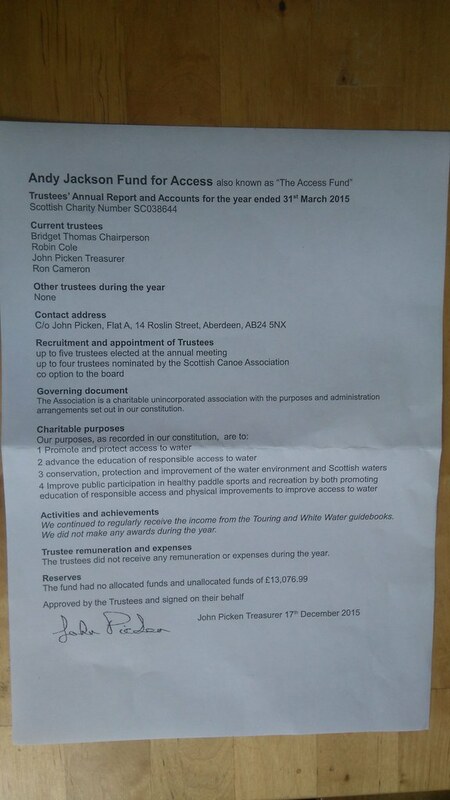 There’s still no information on the web of the highly spoken about but little visible charity Andy Jackson Fund for Access. My last request in 2014 showed a little active charity receiving money from the Whitewater and Touring guidebooks, receiving money from one grant that didn’t happen and giving a couple of grants out for projects. I sent off for the current latest annual report and accounts which came promptly back. The 2015 accounts show income from books, £358 in year ending 2014 and £1145 in year endings 2015. They show zero outgoings. There’s £13,000 in the bank account sitting doing nothing at all. The trustees are the same as in my previous request. There’s also a report from an independent examiner for the year ending 2014. Maybe the one for year endings 2015 hadn’t been done yet (it’s required for all charities). 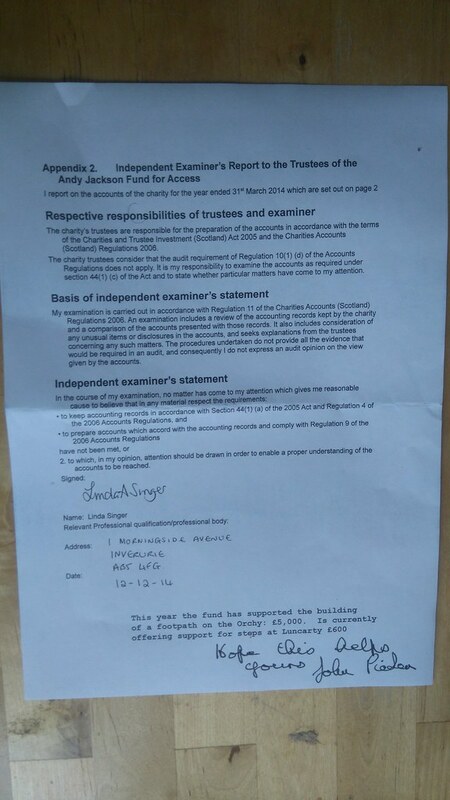 This says that no matter came to the attention of the examiner to suggest the requirements have not been met. There’s also a note at the bottom of this page which says the fund has supported the building of a footpath on the Orchy for £5000 and is offering support for steps at Luncarty for £600. The Orchy footpath was reported in places at the end of last year such as this Forestry Commission article. However there’s no indication of the £5000 in the accounts. Was it not needed in the end? There’s also no indication of the £600 for steps at Luncarty so I presume this hasn’t gone ahead yet. I do wonder what could be done with £13,000 to help canoeing access in Scotland. A staff member could be paid for a day or two a week to do something, but it would need some oversight on what. 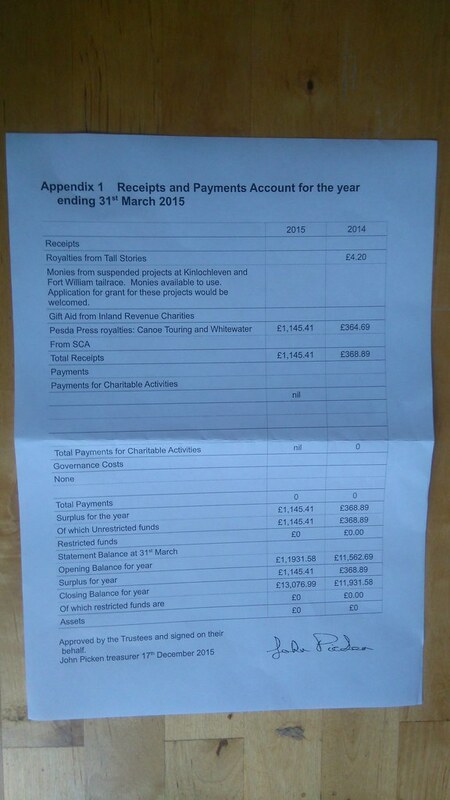 Anyone who is interested in how canoeing is funded in Scotland should also look at the financial report which the SCA has on their Self Service website by my dearest dad, it gives a really good summary for the first time of how’s the SCA’s activities are funded. I’m also pleased to see the SCA committees are being put on a more formal basis with terms of reference and people being asked to help which I haven’t seen happen before. Maybe next year I’ll have the energy to help in some interesting way.